Your connection with this website is not completely secure? 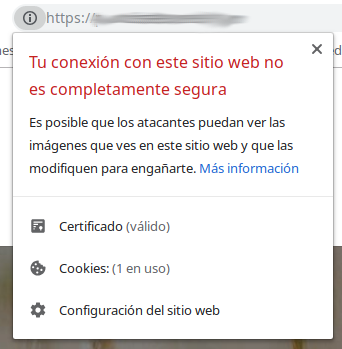 If you have a web page (usually a WordPress) that works with SSL certificates (and if you do not have it immediately), you may find this error that, although it does not prevent our pages from being seen, may cause some elements they do not look good, or we get diverse errors. The error appears because, although our website is secure, some of the elements it contains are not. How do I see where the problem is? The easiest option is, within the page that gives us the problem, open a developer console, (usually just press F12 to appear). Within the console tab of this, we will see messages indicating which resources are those that are incorrectly configured, in order to change them. Now, we just have to change those links in our template so that the error disappears. If we want to avoid this kind of problems, the best way is to use links that only contain a double bar. The browser will use http or https as appropriate, or we will not have to worry about changing it by hand.